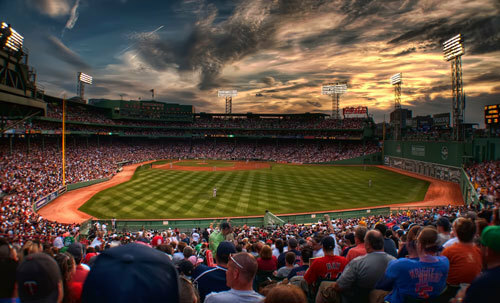 Nicknamed "America's Most Beloved Ballpark", Boston's Fenway Park lives up to its billing! At 95 years old, Fenway is not only one of the most historic stadiums, it's also arguably one of the best sports venues in the world. 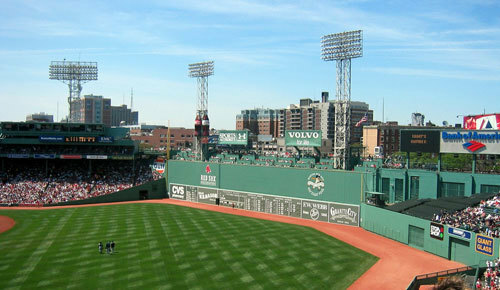 Built in 1912, Fenway Park is the oldest baseball stadium in the major leagues. For the past 95 years, Fenway as been the home of MLB's Boston Red Sox. This stadium has seen its share of great teams and players. Baseball greats such as Ted Williams, Carlton Fisk and Babe Ruth have worn the red, blue and grey colors of the Red Sox. The team has also won six World Series titles, although after they won the 1918 World Series, they didn't win another one until 2004. The drought is known as the "Curse of the Bambino". One of the first things you notice when you go to a Red Sox game is the big green wall in left field. Known as "The Green Monster", the wall is 37 feet tall and 240 feet long. There is also a rare manual scoreboard on the bottom of the wall. The Green Monster is the signature characteristic of this ball park. While Fenway does not have all of the fancy features that the new ball parks have, the experience you'll have at a Red Sox games is truly unique. Other than Chicago's Wrigley Field, no other stadium can offer the same historic feel that Fenway can. They say the grass is greener and the hot dogs are tastier at Fenway Park. It is also said that the most passionate and knowledgeable baseball fans are right there in Boston. That brings us to our next point - never wear Yankees gear at this ball park! Fenway Park's seating capacity is 36,298. That is the second lowest in the MLB. Former US President Franklin D. Roosevelt made a famous speech at Fenway Park during the 1940 Presidential race. 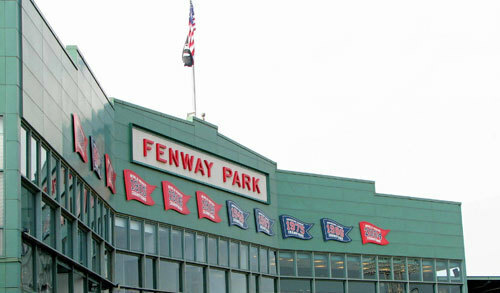 Several scenes for the 2005 movie Fever Pitch, starring Jimmy Fallon and Drew Barrymore, were filmed at Fenway Park. Fenway Park opened on April 20, 1912, just five days after the Titanic sunk. No one has ever hit a home run over the right field roof at Fenway. Come on Barry Bonds, we're waiting! More Sports Facts and Trivia! World Series - When Will the Sox Win Again?